What Is Beach Chic Style? For those who live by the words "life's a beach," reflecting that mentality in home decor is an appealing option. If you've seen beach chic homes but can't quite put your finger on what makes them so, well, beachy, we can help you out. 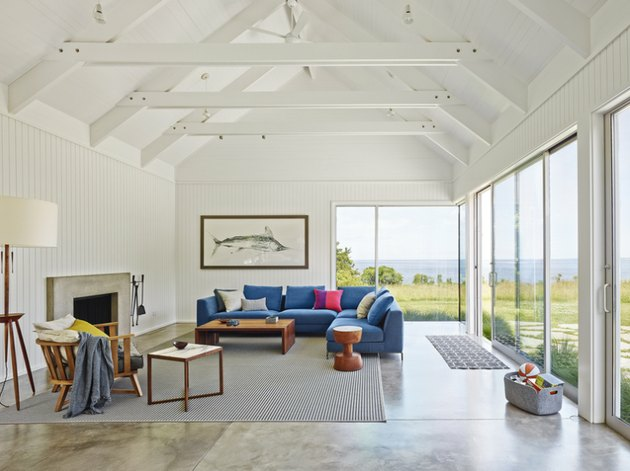 In a nutshell: Beach chic style is open to interpretation, but some of the hallmarks of the beach-inspired home are light and bright color palettes, open and airy rooms, and a home that invokes a year-round summer feel. All white walls, linens, and blues inspired by the ocean all comprise a beach chic style home. 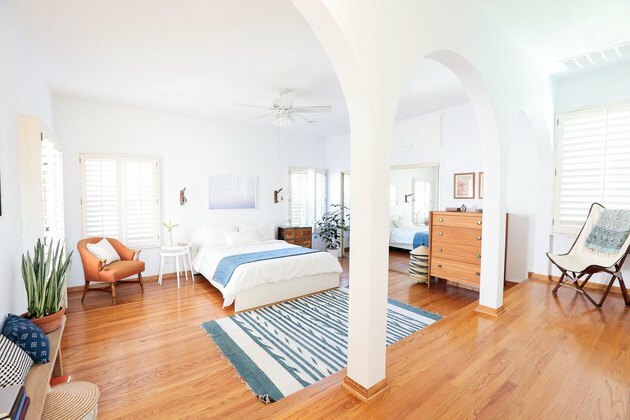 The bright and airy layout is reminiscent of beachside properties where the cool ocean breeze fills the rooms. 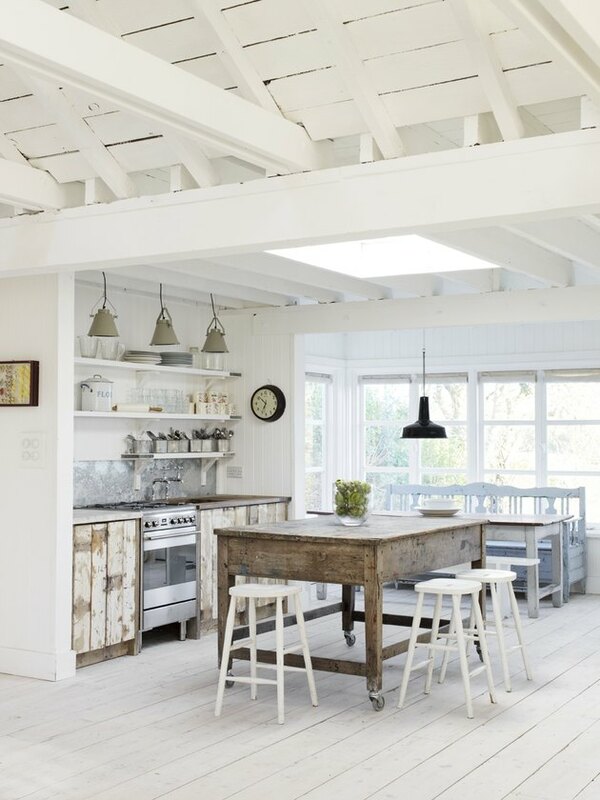 White walls, neutral color palettes, skylights, and bay windows are all very beach chic-inspired. Beach chic style homes tend to make use of hybrid indoor-outdoor spaces. This design element takes inspiration from those coastal cities where the weather is so nice year-round that you can live partially outdoors. While your gut may say to decorate with a nautical theme in mind, our advice is to go subtle — a pop of ocean blue, a single piece of beach-inspired artwork, an old ship or sailing detail. Incorporate just enough that the beach style is obvious but not overwhelming. Consider the retro '70s beach home and what might have been in that house: There might be some mismatched furniture, some driftwood as art, or Acapulco chairs adding character to a space. 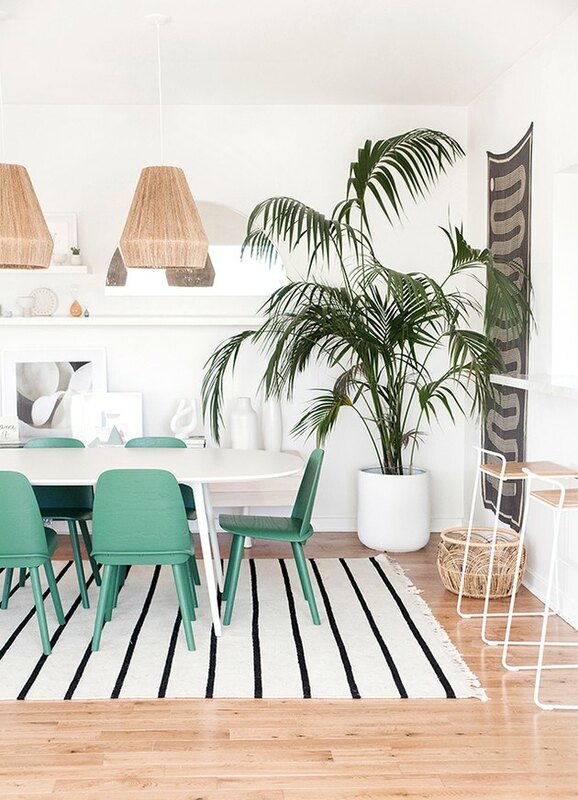 To go from beach shack to beach chic, find inspiration in the retro seaside bungalow, but elevate it and modernize it for today. 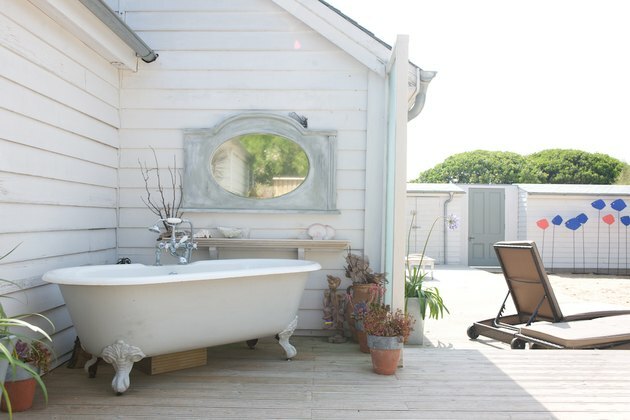 Nothing says beach home quite like an outdoor bath or shower. You don't even need to dry off when you're bathing in the sun. A beach chic home feels like a vacation home. Why feel like you ever need to go anywhere when your own home transports you to the beach? 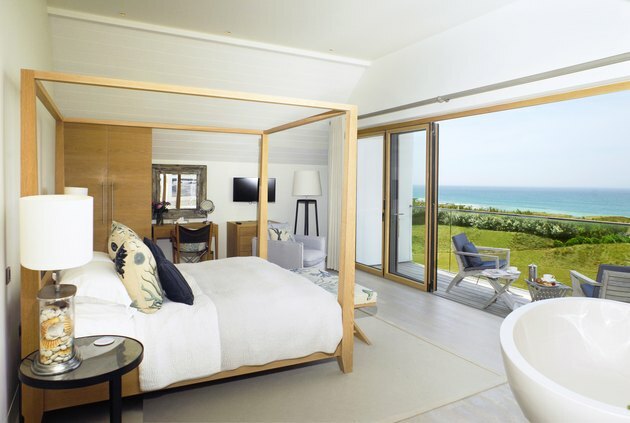 If you don't have a view of the beach like this one above, bring in some shell art, a fluffy down bed that feels like a hotel, and windows that transport you outside the confines of your four walls. The bathroom in a beach chic home is key. When you've come home from a long day of surfing and rolling in the sand, that post-beach shower is truly where it's at. 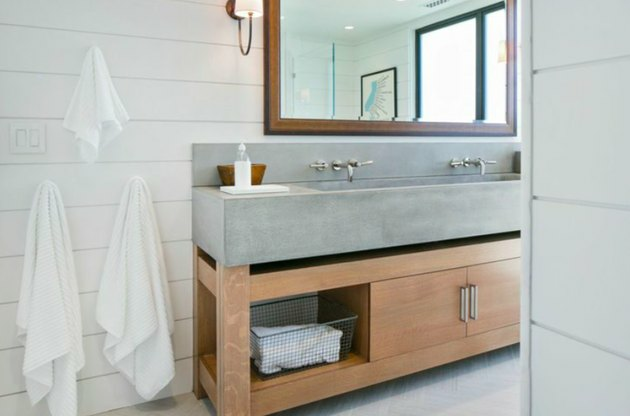 We like this trough-inspired sink and white wood paneling on the walls, which bring to mind a luxury version of a beach outhouse. Bring the palm tree-dotted skylines of Palm Beach or Santa Monica into your own home. It's the ultimate beach chic move to have tropical-inspired plants — like potted palm trees — in your home as decor. Part of the beach aesthetic is a chill, pared down life, which blends well with one of today's preferred decor trends: minimalism. 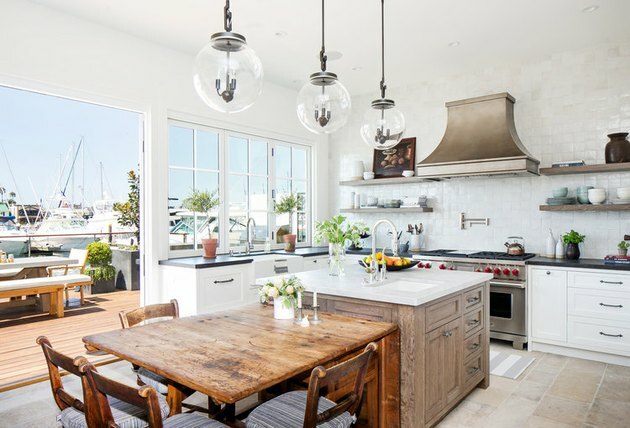 Of course, the most beautiful beach chic homes are quite the luxury, but try to do away with appliances, extra TVs, and unnecessary decor frills — place priority on getting your color scheme and textures right.